The building consists of two individual units which rent separately. The “lower” beach level home listed on as (HomeAway #161720) is a 1200 sqft. 3-bedroom with 2-bathrooms and offers exclusive use of the beach deck. The “upper” home is listed as (HomeAway #254059) consists of upper floors 2 & 3 with 5-bedrooms, 4.5-bathrooms at 3800 sqft. and a 3rd floor deck with outdoor fireplace. The garage is attached to the “upper” home and is for the exclusive use of the “upper” home. Each home has entrances on opposite sides of the building, their own paths to the beach, and their own outdoor showers. The homes do not share any amenities. This upper level home offers an unbelievable 3800 sq ft of space that includes 5 bedrooms and 4.5 baths along with a 2 car garage and an awesome rooftop deck with a fireplace. Four of the bedrooms in the home offer king size beds and the fifth bedroom has 2 sets of bunk beds for the kids. The kitchen is a cook's dream and the dining area has enough seating for everybody in your party. Whether it's sitting in front of the High Definition Plasma Televisions watching your favorite movie or sporting event or relaxing in front of an evening fire on the rooftop deck, no matter how you choose to unwind from a fun day at the beach this home is the perfect answer. Call today and book your perfect family getaway. Sunset Beach sits within a green belt of non-metered overnight public parking. There is typically parking all around the home at all times of the year. You can see aerial view of parking by mapping address 16525 S Pacific Ave. Sunset Beach, CA. 3800 sqft. of beachfront living!! Many beach towels and linens on hand! Washer is inside the home and not shared with others. in addition to a private two car garage, Sunset Beach sits within a green belt of non-metered overnight public parking. There is typically parking all around the home at all times of the year. 2 car attatched garage with access to home. All kitchen items and serving platters etc., Most all things you may want or need. Two 50' LCD Flat Screens and LCD TV's in everyroom. Outdoor fire place sink and BBQ on outdoor roof deck. Minimum Age Limit of 30 years for Renters. Great house and fabulous kitchen. Lots of room and a fun place to stay. We love this place!!! There were 12 of us, and we rented to top of the house--it was SO perfect! The view, the outside deck on the top floor, and the game room were awesome! Bedrooms and baths were beautiful. Just a wonderful place!!! Right on the beach. Amazing sunset views. Walking distance to some great restaurants. If you want to be right on the beach and have the convenience of walking out onto the sand, this rental is a great option. As a few other reviewers have mentioned, the rental could definitely use some remodeling, touchups, and upgrades. That is the only reason not to give it 5 stars. Johnny was easy to work with and answered all our questions. This place was great for our extended family get together over Xmas. The house is very spacious and very well stocked for all your needs. 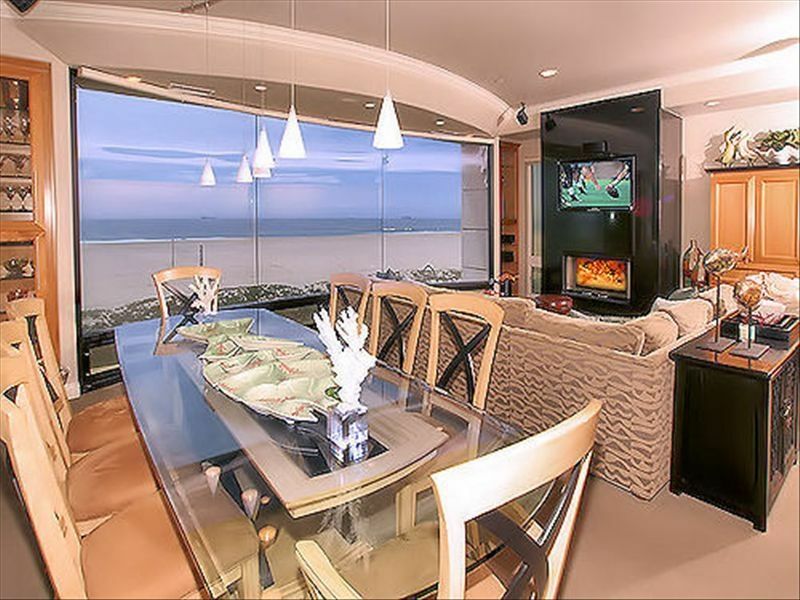 The great room overlooking the beach is breathtaking. We had Xmas dinner for 11 and everyone fit around the dinner table. The only downside I would point out is that the mattresses are a bit older and not the most comfortable but good enough. This unit is “upper” - meaning it has no direct beach deck on the sand but has awesome views from the second story glass wall and roof deck. Access to the beach is from the side of the house. Another nice touch is the outdoor shower to rinse of the sand. I would definitely recommend this place! Thanks for the great review. Beds were purchased 4 years ago so I'm not sure we can say they are a bit old. However, bed comfort is very subjective. Some like a firm bed others soft, therefore its so difficult to make ever one happy....but we try!!! This is the 2nd year we've stayed here. We are a group of approximately 18 ladies and we rent the upstairs and downstairs. A few things need upgraded; but overall it is very spacious for us all; the view is magnificent; and soooo roomy. Will definitely be here again. House was very comfortable. Quiet and suited well for couples to share and still have quiet areas. The game room was awesome. And the beach is fantastic. Could walk to coffee restaraunts and bars. Loved it. Other Activities: Shopping, basketball, shuffleboard, boating, racquetball. Weekly Rate $4950-$7500 Security Deposit $1000 Cleaning $150 Peak Season Nightly Rates are $1375/night 3 night minimum. Weekly (Friday-Friday) Rates Apply During Peak Season and Holidays. All Rates DO NOT include cleaning fee of $150. Refundable Security Deposit $1000.00.